Julia is the only song in The Beatles catalog that John performed unaccompanied – without any help from his friends. The minimal arrangement is comprised of a simple mildly-flanged, finger-picked solo acoustic guitar and voice. There is some double tracking, but essentially what we have here is John naked. The title suggests the song was about his mother but most of the imagery of the lyric references his soon to be wife. In Japanese, the name Yoko literally means "ocean child." The words in the song lead us towards meaning without ever fully explaining themselves. The mother and wife image merge in a way that is touching and not as unpleasant as it could be in less skilled hands. The vagueness of the lyric is its strength. Concepts of mother and lover were always very confused for John so there is a touching honesty here. In the last verse he runs out of words completely and he hums where the lyric should be but the sense of beauty, regret and wonder remain. The previous song on “The White Album” is Paul’s “I Will”. It is fascinating to compare these two recordings. It is almost as if John and Paul had a songwriting competition to determine who could write the more moving love song. Listening to them sequentially the two songs tells you much about the two men. The differences of their world views, strengths and vulnerabilities are clearly stated. Paul’s melody and arrangement is sophisticated. He knows exactly how to make you feel what he wants you to feel at any given moment. The vocal is g entle and heartwarming. The innocence of love is celebrated with every phrase. We are in the hands of a professional. John is more in tune with the mystical. “Julia” is a funereal dirge which is appropriate considering the tragic circumstances of his mother’s death. The singer knows about the pain of loving something so thoroughly that it will empty him. There is beauty in such pain and John expresses it exquisitely. As usual with any competition between John and Paul, I pronounce it an honorable tie and am glad to possess both songs. This is the strength of The Beatles. To reflect similar emotions in two entirely different ways. Two sides of two quite different currencies. “Julia” was yet another song that was written at Rishikesh in northern India. I’m not sure exactly how much it cost to stay with Maharishi Mahesh Yogi, but there is no doubt they got their money’s worth. 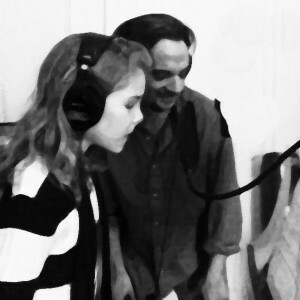 The premise of the ukulele version is that Don is teaching Emily how to sing the song. Don reminds Emily of what lyrics to sing but it is quite clear that Emily possesses a talent that can not be taught. By the end of the piece she is singing solo and Don has tears in his eyes as do I. Don Rosler was born in a blackout, for real, but everyone he knows is tired of hearing that story. What some don’t know is the reason he stopped playing sax in his mid-twenties: he suddenly developed a neurotic aversion to the texture of a reed in his mouth. In the spirit of “one door closes, another opens” he then shifted over to writing lyrics and songs (which spared him having to fumble through “Caravan” and “Giant Steps” at breakneck tempos). Don wrote lyrics for three compositions with Roger Treece and ten-time-Grammy-award-winning Bobby McFerrin for the new critically acclaimed Bobby McFerrin CD, "VOCAbuLarieS" (Decca/Universal), which also features over 50 singers. (The BBC called it “an instant classic…a kaleidoscopic celebration of the human voice.”). Roger and Don were also commissioned to write for the Chicago Children’s Choir, the Grammy-nominated L.A. Master Chorale, and the Grammy-award winning U.K.-based King’s Singers’ latest CD (released in June 2010).